"Sampath Speaking" - the thoughts of an Insurer from Thiruvallikkeni: US Naval Ships collide ~ is it possible to avoid collisions ? US Naval Ships collide ~ is it possible to avoid collisions ? A collision is an event in which two or more bodies exert forces on each other for a relatively short time. When a cat or cattle walks on grass – there too, each contact their paws make with the ground is a collision ! ~ like road accidents, where vehicle collide, this post is on ‘collision of ships’ at sea ! – the physical impact that occurs between two ships resulting in a damaging accident; not necessarily involving two vessels – it could be a vessel and a stable or a floating structure like an offshore drilling platform or an ice berg or even wharf or quay. Given the magnitude of those large vessels at sea, the impact could be devastating – it is not pure economic cost, it could be loss of lives, loss of property, disruption of maritime traffic resulting in consequential losses, and .. .. pollution risks and more. 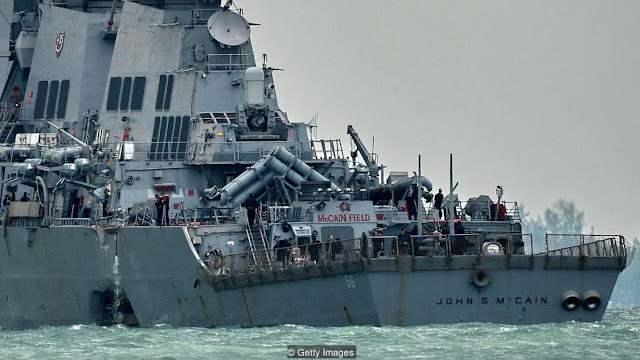 USS John McGain is in news for wrong reasons - the U.S. guided-missile was struck by a chemical tanker near the Straits of Malacca and has since arrived in Singapore. Photos released by the Navy show the extent of the damage to USS John McCain (DDG-56) as the ship pulled into Changi Naval Base. An oval indentation more than 20 feet wide and seven to eight feet high from the water line can be seen in the port side of the destroyer, suggesting the dimensions of the hole in the ship could be as large as 20 feet by 16 feet. McCain (DDG-56) collided with the Liberian-flagged chemical tanker Alnic MC around 5:24 a.m. on Monday, local time. In contrast to the entrance of USS Fitzgerald (DDG-62) into Yokosuka, Japan in June, McCain his riding higher in the water, suggesting McCain may have taken on less water. USS John S. McCain (DDG-56) is an Arleigh Burke-class destroyer currently in the service of the United States Navy. She is part of the Destroyer Squadron 15 within the Seventh Fleet, and has her homeport at the Yokosuka Naval Base in Yokosuka, Japan. This warship is named after John S. McCain, Sr., and John S. McCain, Jr., both admirals in the United States Navy. The ship's nickname is "Big Bad John" and it is embroidered onto back of the hats worn by the ship's company. It has had a deep impact ~ ten American sailors are missing and five injured as a result of the collision. Singaporean, Malaysian and US search and rescue teams, consisting of patrol ships, helicopters and tug boats, were deployed to the area to look for the missing crew. The McCain had been heading to Singapore on a routine port visit after conducting a sensitive freedom of navigation operation last week by sailing near one of China's man-made islands in the South China Sea. Singapore sent tugboats and naval and coast guard vessels for the search and rescue effort. Malaysia's navy chief tweeted that two ships as well as aircraft from its navy and air force were helping with the search for the missing sailors. There was no immediate explanation for the collision and the Navy said an investigation would be conducted. Singapore, at the southernmost tip of the Malay Peninsula, is one of the world's busiest ports and a U.S. ally, with its naval base regularly visited by American warships. The collision was the second involving a ship from the Navy's 7th Fleet in the Pacific in two months. Seven sailors died in June when the USS Fitzgerald and a container ship collided in waters off Japan. The Fitzgerald's captain was relieved of command and other sailors were being punished after the Navy found poor seamanship and flaws in keeping watch contributed to the collision, the Navy announced. An investigation into how and why the Fitzgerald collided with the other ship was not finished, but enough details were known to take those actions, the Navy said. The damaged ship McCain sailed then under its own power to Singapore. The tanker it collided with, Alnic MC, sustained damage to a tank near the front of the ship 7m (23ft) above the waterline, but none of its crew were injured and there were no oil spills. The tanker has a tonnage of 30,000 which is about three times that of the USS John S McCain's, and at 600ft (182m) it is slightly longer than the 505ft-long US destroyer. The timing of this is awkward for the United States. It was the first day of annual drills between the US and South Korean armies, a show of might in the face of North Korean belligerence. There have been collisions in the past and some occurring in recent times – the ships involved in these recent incidents are large and well-fitted with radar and navigation systems. There are also GPS tracking, automatic identification systems (AIS) and radio communications. How could such collisions happen ? and could something be done to prevent their recurrence. “Provided you are keeping a radar watch and a visual lookout, then collisions are avoidable,” says Peter Roberts, directory of military sciences at the Royal United Services Institute (RUSI). Roberts says he has travelled on commercial ships where sometimes there is no-one on the bridge at all. “An alarm is going off on the radar and they’re reliant on that alarm waking whoever is on watch,” he says. Still, two major accidents involving navy ships in as many months is extraordinary, he adds. “It’s very, very rare,” he says. It could, of course, just be a deeply unfortunate coincidence. But some are asking whether foul-play or sabotage was involved – were navigation systems hacked to increase the likelihood of a collision, for instance? There has been at least one report of potential GPS position spoofing affecting ships in the Black Sea in recent months, which has led to concern among a few observers that some nation states may be hacking ships in an effort to throw them off course. There is no evidence yet for this being a factor in the USS Fitzgerald or John S McCain cases – despite the conspiracy theories floating around the web. But Roberts says that the scenario is worth considering. The seas are becoming more and more crowded, and the global number of commercial ships continues to grow. When such accidents occur, investigators often find that human error was the ultimate cause rather than anything more nefarious, says Henrik Uth at Danish firm Survey Association, a maritime surveyor contracted by insurers of ships. He adds that his firm’s own investigations have found many instances in which the crew has actually helped to avoid dangerous near-misses. “It’s easy to blame the captain for when it goes wrong, but we tend to forget to compliment him for all the times he saved the vessel from imminent danger,” says Uth. It’s not just collisions that threaten ships and their crew, either. Right now, a British ship, the MV Cheshire – loaded with many thousands of tonnes of fertiliser – is on fire and has been drifting in seas near the Canary Islands for days. The crew had to be airlifted to safety. The seas are becoming more and more crowded, and the global number of commercial ships continues to grow. According to the UK government, there were around 58,000 vessels in the world trading fleet at the end of 2016. The size of the fleet, if measured by weight, has doubled since 2004. In the immediate aftermath of a collision that has breached a ship’s hull, the crew must act fast. As well as pumping out huge volumes of water, the vessel will need to be temporarily braced, explains Peter Roberts at RUSI. “The walls, ceilings and floors will be under tremendous strain of weight of water and they’ll have to put additional supports in and around those – they’ll have to make those on board themselves,” he says. In the case of the USS John S McCain, which collided with a tanker this week, it will likely have received extra pumps and specialist personnel thanks to helicopter support from a nearby American aircraft carrier, says Roberts. Once at port, plates may be welded to the side of the ship to seal its hull again. Uth suggests that since the financial crisis of 2008, many shipping companies have faced tighter margins and may have underinvested in crews as a result. “They need to find the right crew and retain them,” he explains. “The crew has to get to know the vessel because it is a sophisticated piece of hardware.” And on any large ship, a typical crew often comprises a mix of different languages, nationalities and safety cultures, he adds, making the job of keeping the vessel safe all the trickier. One rising worry is modern sailors’ reliance on technology, says former navigator Aron Soerensen, head of maritime technology and regulation at the Baltic and International Maritime Council (Bimco). “Instead of looking at the instruments, you have to look out the window to see how the situation actually evolves,” he explains. “Maybe today there’s a bit of a fixation on instruments.” But he points out that maritime organisations have tried to come up with ways of reducing the likelihood of collisions happening. One idea he mentions is the separation of traffic – neatly co-ordinating streams of vessels travelling through a busy strait, for example, by moving them into distinct lanes heading in the same direction.The first such “traffic separation scheme” was set up in the Dover Strait in 1967 and there are now around 100 worldwide. It’s in everyone’s interests to avoid a collision. Not least because under international regulations, both parties share liability for such accidents. In other words, captains are obligated to avoid colliding with another vessel even if their own ship has every right to be at its current position. While the recent accidents are troubling, there is good news from the industry too, Uth says. He points out that the number of total losses – for example when a ship sinks – has been falling year-on-year recently. According to data from insurance firm Allianz, there were 85 total losses of large ships recorded in 2016, a fall of 16% on the previous year. Of all 85, just one total loss was the result of a collision. There’s no doubt that technology has in many ways contributed to safety in the shipping industry – but life as a seafarer remains dangerous. As more and more large vessels plough the world’s seas, the need to captain these behemoths has not evaporated, rather, it has grown ever more pressing. Two days after ordering a rare suspension of ship operations worldwide, the US Navy relieved the commander of the fleet that had sustained four accidents in Asia and the deaths of more than a dozen sailors this year. 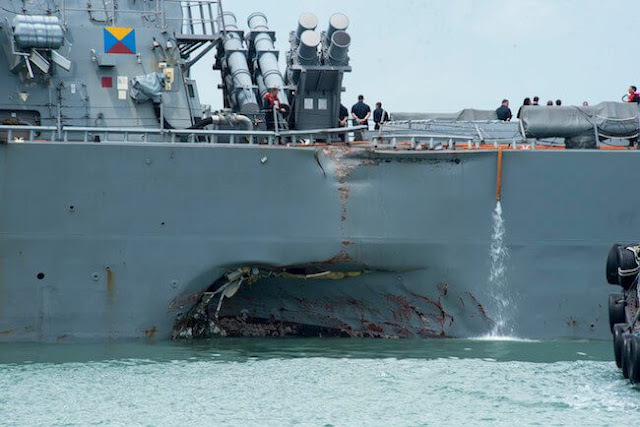 Vice Adm. Joseph P. Aucoin, the head of the Seventh Fleet, the Navy’s largest overseas, was removed Wednesday in connection with the four accidents since January, including two fatal collisions in the past two months, according to a statement by the Navy. Admiral Aucoin had been expected to retire in the coming weeks, but his superiors pushed up his departure date after losing confidence in his leadership. The action was first reported by The Wall Street Journal.